UP FOR SALE IS THIS VINTAGE WATERCOLOR ON PAPER BOARD PAINTING SIGNED BY ARTIST E. THE SIZE IS 15" X 18". THERE IS MINOR WEAR MAINLY ON THE EDGES OVERALL THE CONDITION IS GREAT. 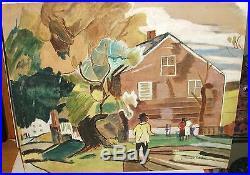 TRUDEAU AFRICAN AMERICAN LANDSCAPE VINTAGE ORIGINAL WATERCOLOR FOLK PAINTING" is in sale since Thursday, December 13, 2012.